If you combine all the anti-Corbyn smears together, they actually add up to Frank Field! One of the most extraordinary things about Labour right-wingers is their willingness to demonstrate their own mendacity. And there's no finer example of this than their reaction to Frank Field's resignation of the Labour whip after his local Labour party recently voted "no confidence" in him continuing as their MP. To see Labour right-wingers suddenly lauding Frank Field as some kind of political saint because he's attacked Jeremy Corbyn just goes to prove how utterly devoid of principles this atrocious mob really are. 1. Labour right-wingers continually smear and attack Jeremy Corbyn for supposedly not doing enough to oppose Tory Brexit (despite the fact Labour have opposed the Tories in almost every actual Brexit vote). 2. Jeremy Corbyn once again opposes Tory Brexit by voting to take the ludicrous Tory threat of a "no deal" economic meltdown off the table, but he's betrayed by Frank Field who votes with the Tories to save Theresa May's skin. 3. Frank Field resigns the Labour whip after his local Labour Party vote "no confidence" in him because of his support for hard-right Tory Brextremism. 4. Frank Field jumps before he's pushed by resigning the Labour whip, and Labour Right wingers suddenly begin lauding him as a political saint and using his departure as a stick to attack Jeremy Corbyn with! 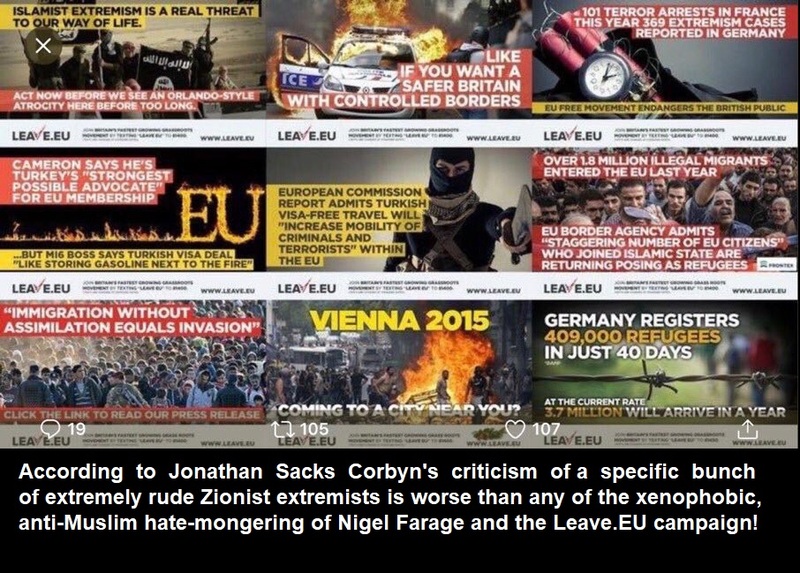 Only the most blindly partisan of political fools could have failed to notice the way the Labour right-wingers switched seamlessly from using accusations of Brextremism to attack Jeremy Corbyn, to actually siding with a Brextremist to attack Jeremy Corbyn. 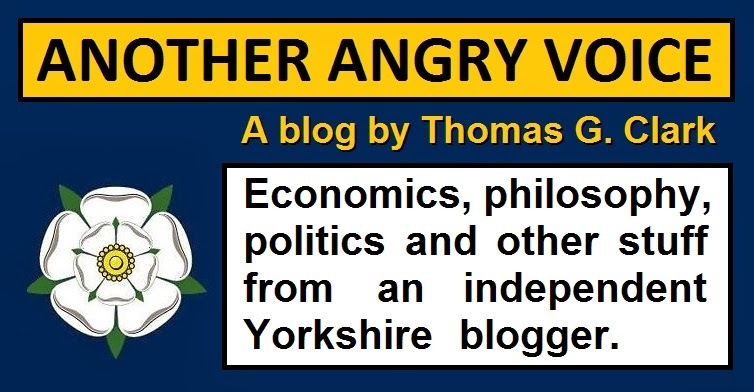 Think back through the anti-Corbyn smears that the Labour right-wingers have used in their desperate efforts to derail the democratic socialist movement he leads and re-install an adherent of the centre-right neoliberal orthodoxy as Labour leader. They use whatever out-of-context quotes and misleading pictures they can find to paint the lifelong anti-racist Jeremy Corbyn as an anti-Semite ... but in 1993 their new hero Frank Field explicitly referred to a political opponent's Jewishness in order to accuse him of enacting Nazi policy! They try to claim that Corbyn is some kind of radical Brextremist ... but when Corbyn tried to prevent the threat of a ruinous "no deal" Tory Brexit their new hero Frank Field betrayed the Labour Party in order to keep "no deal" on the table and the Tory Brextremists in government! Despite the fact that most of Jeremy Corbyn's backbench rebellions against the Labour leadership came on issues where Labour and the Tories were singing from the same neoliberal hymn sheet (privatisation, academy schools, anti-trade unionism, PFI, the invasion of Iraq, turning Libya into a terrorism-riddled power vacuum) Labour right-wingers have continually portrayed Corbyn as someone who voted alongside the Tories ... but then Frank Field explicitly voted against the Labour leadership in order to prop up Theresa May's Brextremist government, and he's suddenly their new hero! They try to pretend that Corbyn is some kind of xenophobic ranter who hates foreign workers ... but in 2011 their new hero Frank Field publicly blamed immigrant workers for supposedly taking 9/10 British jobs. They try to claim that Corbyn is some kind of horrible Enoch Powell figure ... but their new hero Frank Field publicly lauded Enoch Powell, and the regularity of his anti-immigrant rhetoric led to the Church of England Bishop Peter Selby labelling him "the new Enoch Powell". 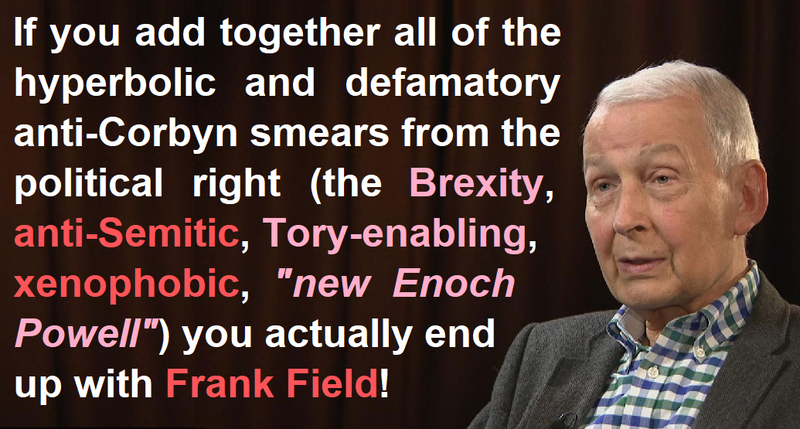 So if you stitch all the Labour right-wingers' hyperbolic anti-Corbyn smears together (the anti-Semitic, Brexity, Tory-enabling, xenophobic "new Enoch Powell") into some kind of freakish Frankenstein monster of a Labour politician, you actually end up with Frank Field! But somehow they Labour right-wingers are all busy conferring political sainthood upon him because he publicly attacked Jeremy Corbyn! The mendacity, hypocrisy, and downright dishonesty of painting Jeremy Corbyn as this Brexity, xenophobic Powellesque monster, but then actually lauding the actual Brexity, xenophobic, Powellesque monster of the Labour movement as a political saint because he criticises Corbyn. It's absolutely extraordinary. Perhaps somebody should tell these people about how "the enemy of my enemy is not automatically my friend"? Or maybe we should just allow these people to wallow in their own hypocrisy? Jeremy Corbyn's policy of preventing tax haven-based companies from profiteering from public funds isn't radically left-wing, it's not even particularly left-wing at all, it's actually just common sense. 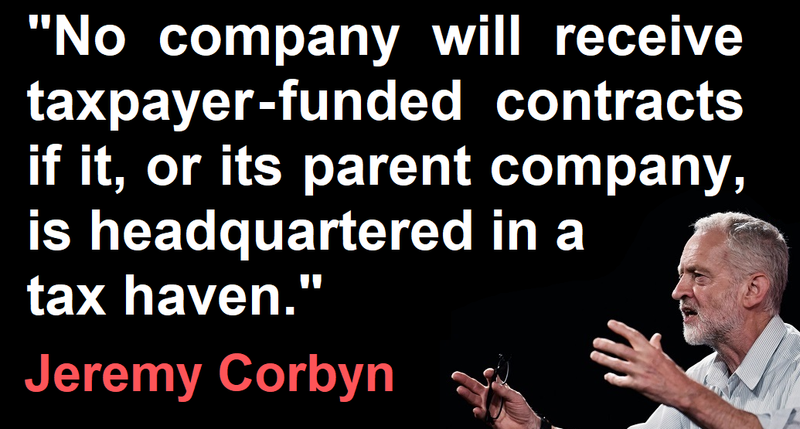 A radically left-wing policy would be to ban all corporations from undertaking government-funded work (or even to turn all corporations into worker-controlled syndicates) but Corbyn is proposing nothing of the sort. All he's saying is that if companies intend to make profits from public funds via outsourcing contracts, they should at least demonstrate that they're paying their fair share in tax. It's actually a demonstration of how fanatically right-wing the cult-like Thatcherite political consensus really is that any of them ever thought it OK for corporations to dodge paying tax on their publicly funded profits in the first place, and that absolutely nothing has been done to clamp down on these ridiculous practices while orthodox neoliberals have controlled the levers of political power. Of course the political right are furious with these proposals, because corporate parasitism on the state is a significant business model for the mega-rich. Tax-dodging corporate parasitism is basically risk-free, because profiteering from desperately one-sided public sector outsourcing contracts and avoiding paying tax on the profits carries way less risk than investment in anything innovative or economically productive. And if the contract somehow fails, the state ends up stepping in anyway to clear up the mess at the public expense. Dodge paying tax on the publicly funded profits, and then use public funds to pay for the losses! It's an incredibly brazen business model, but it's been going on for decades (remember when the Blair government actually privatised the HMRC property portfolio into the hands of a private company based in Bermuda for tax reasons? ), and Jeremy Corbyn is threatening to put a stop to this ridiculous nonsense. It's common sense proposals like this clamp-down on tax-dodger profiteering on public funds that the political right are terrified of, because they know that the vast majority of British people would agree with them wholeheartedly if they heard about them. So instead of openly declaring their support for tax-haven based profiteering from public funds, the political right resort to a relentless cascade of smears, deceptions, and outright lies. 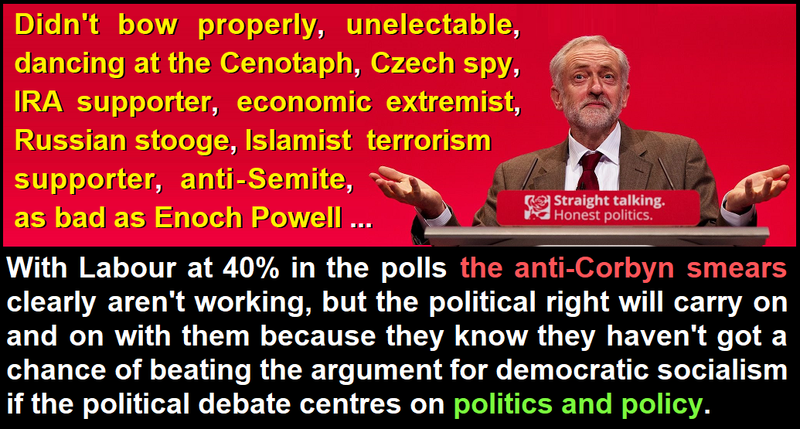 They know they can't counter Corbyn on policy because the more people find out about Corbyn's actual policies, the more people end up agreeing with him and supporting him, so their only hope is to continue with the smear campaign in the vain hope of debasing the standard of political debate to such an extent that people remain largely unaware of Corbyn's actual policies. 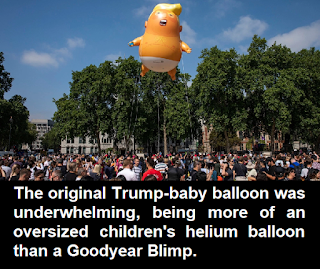 When some Lefty-liberal protesters decided to crowdfund a Donald Trump baby blimp for his state visit to the UK, right-wing Trump supporters absolutely shat themselves with rage. How dare Sadiq Khan allow people the freedom to protest with a silly blimp they raged. And then they concocted a master-plan: "Let's crowdfund a blimp of our own to put Sadiq Khan and the lefty-liberals in their place once and for all". So that's what they did. They actually invested their time and their money in creating a blimp of Sadiq Khan wearing a yellow bikini. Oh how they must have anticipated the lurid victimhood narratives they could spin to their gullible followers when the horrible leftist tyrant Khan banned the balloon. But then disaster struck for them. 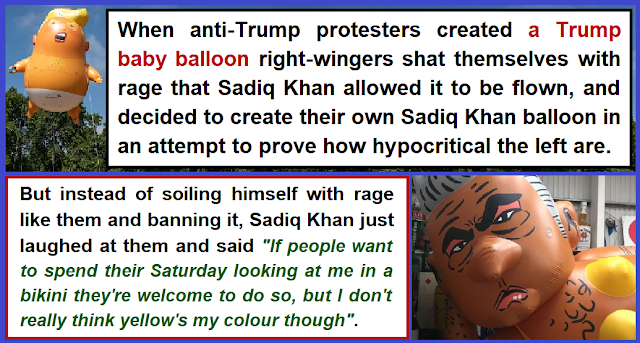 Instead of banning the balloon in a fit of rage Khan just laughed at it. "If people want to spend their Saturday looking at me in a yellow bikini they're welcome to do so, but I don't really think yellow's my colour though". And Khan's not the only one who is going to be laughing at these deluded right-wing idiots for wasting their time and money on this, because not only did their protest backfire when Khan just laughed at it, it's also a demonstration that they've got no ideas of their own, and rely on pathetically ripping off ideas from the liberal-left rather than doing anything innovative or remotely useful of their own. 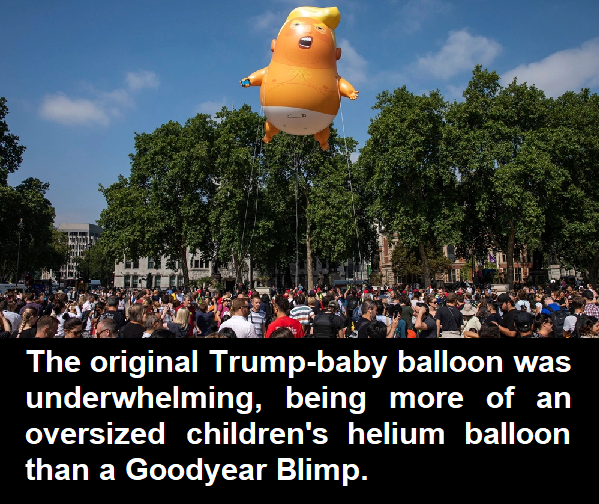 In fact they've not just ripped off a leftie-liberal idea, they're so dull-witted that they've ripped off a pretty rubbish lefty-liberal idea, because a 20ft odd balloon is way less impressive that it sounds (more of an oversized child's helium balloon than a Goodyear Blimp), and whether you're right-wing or left-wing, crowdfunding tens of thousands of pounds to create an underwhelming parody balloon is an absolute waste of effort when that time and money could be used actually helping needy people, or supporting grassroots political activism. The right-wingers behind this pathetically derivative balloon idea were hoping to own the left, but they've simply ended up owning themselves by nicking a rubbish idea off the lefty-liberals and making it even more lame than it already was. Does Jonathan Sacks really speak for "all Jews"? After the former Chief Rabbi Jonathan Sacks hit the headlines by comparing Jeremy Corbyn's criticism of a tiny bunch of extremely rude Zionist extremists who had been abusing the Palestinian ambassador in 2014 with Enoch Powell's notorious 1968 "Rivers of Blood" speech, many people quite rightly asked what gave him the authority to make such a hyperbolic judgement, especially given that it was only last year that he was publicly praising an extreme-right, xenophobic, anti-Muslim, Enoch Powell-praising diatribe as "a good book". As far as I'm concerned Sacks has every right to criticise Jeremy Corbyn (and anyone else for that matter) but he's left himself wide open to accusations of rank hypocrisy by promoting a book that praised Enoch Powell for his divisive xenophobic rhetoric one minute, then using the horrible spectre of Enoch Powell to launch a hyperbolic and politically partisan attack on the lifelong anti-racist campaigner Jeremy Corbyn the next. 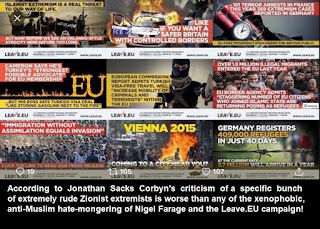 The response of the Jewish Chronicle to people criticising Sacks' comments was an extraordinary defence headlined "the trashing of Jonathan Sacks is a trashing of all Jews". Now if anyone else was making generalisations about "all Jews" they'd quite rightly be criticised for anti-Semitism given that there is definitely no all-encompassing belief system all Jews adhere to, but the fanatically right-wing Jewish Chronicle editor Stephen Pollard (who once said "the left,in any recognisable form, is now the enemy") and the author of the piece obviously see themselves as arbiters of what "all but a tiny minority of Jews" think. Now I'm certainly not going to argue that Sacks is a completely bad person. He's clearly served the Orthodox Jewish community very well over the years otherwise he would never have risen so high, he's lectured in moral philosophy which is a subject I'd surely enjoy discussing with him despite our obvious political differences, and he's done quite a bit of Interfaith work too which I approve of. However, many of his views are problematic to say the least. 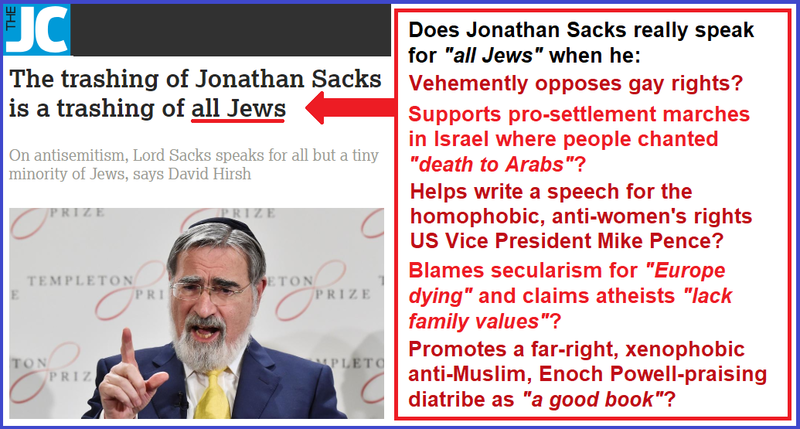 Is it correct to say that Sacks speaks for "all Jews" when it comes to his vehement opposition to gay rights? Or is it fair to argue that a significant proportion of British Jews support Britain's gradual move towards gay equality? Is it correct to say that Sacks speaks for "all Jews" when it comes to supporting the far-right, pro-settler Mizrachi Olami organisation that organises divisive Zionist marches through the occupied Palestinian settlement of Hebron? 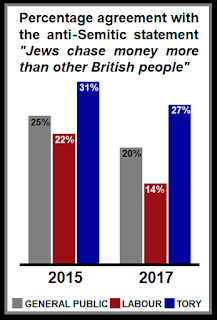 Or is it fair to argue that at least a significant proportion of British Jews oppose the illegal Israeli settlements and strongly disapprove of divisive Zionist marches where people chant "death to Arabs"? Is it correct to say that Sacks speaks for "all Jews" when it comes to his 2010 comments about secularism being to blame for "Europe dying" or his claim that atheists "lack family values"? Or is it fair to argue that a significant proportion of British Jews support western secularism, and another significant proportion of British Jews who self-identify as atheists would be outraged at the allegation that atheists are somehow inferior parents to religious people? 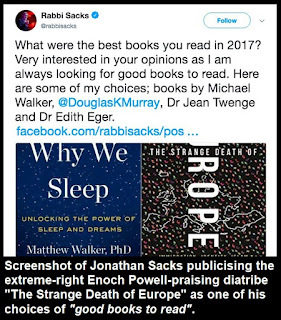 Is it correct to say that Sacks speaks for "all Jews" when it comes to his public recommendation of an extreme-right, xenophobic, anti-Muslim Enoch Powell-praising diatribe as "a good book"? Or is it fair to argue that a significant proportion of British Jews strongly oppose the attempted gentrification of extreme-right, xenophobic, and bigoted ideas, and disagree with anyone who uses their public platform to recommend this kind of extremism as "good"? Is it correct to say that Sacks speaks for "all Jews" when it came to him helping to write a speech for the hard-right, homophobic, anti-abortion US Vice President Mike Pence? Or is it fair to say that an awful lot of Jewish people would be horrified that a senior British representative of the Jewish community would involve himself with such a divisive character? So how can it be correct to claim that he speaks for "all but a tiny minority of Jews" when it comes to his highly partisan attack on Jeremy Corbyn? And how can it be correct to claim that people critiquing Jonathan Sacks' partisan hyperbole, pointing out his hypocrisy, or highlighting his other views are somehow guilty of attacking "all Jews"? If any non-Jewish commentator was claiming the words of one Jewish person were representative of "all Jews", or deliberately othering and marginalising any Jewish people who choose to disagree with their personal view of what Jews should think as "a tiny minority", they'd quite rightly be castigated as anti-Semites. But somehow these kinds of warped generalisations are being passed off as fair commentary by the Jewish Chronicle! It's becoming increasingly clear there is a cult in UK politics, but it's not Corbyn supporters - it's a group of privileged and elitist mainstream media hacks and right-wing politicians who believe that they can brainwash people into voting against their own interests by continually smearing Jeremy Corbyn. So instead of covering any real news/political policies at all, it's just one desperate smear after another from these neoliberal cultists. 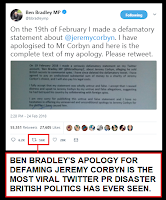 Week after week after week the smears continue, with each new dirty tricks campaign hailed as the magical one that will finally destroy Corbyn and bring the appeal of democratic socialism crashing down. 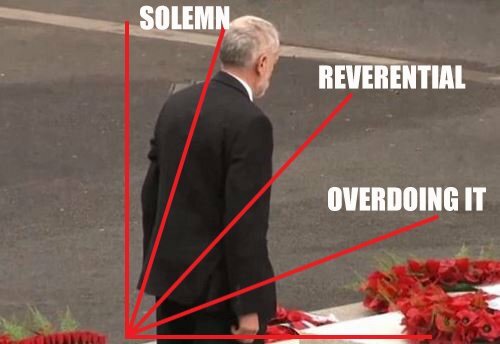 In the early days they tried to accuse Corbyn of disrespecting veterans by not bowing deeply enough at the Cenotaph. But then after a while we found out that Corbyn was the only politician to actually stay behind to chat to the WWII veterans, while the rest of the politicians and dignitaries went off for a slap up meal! 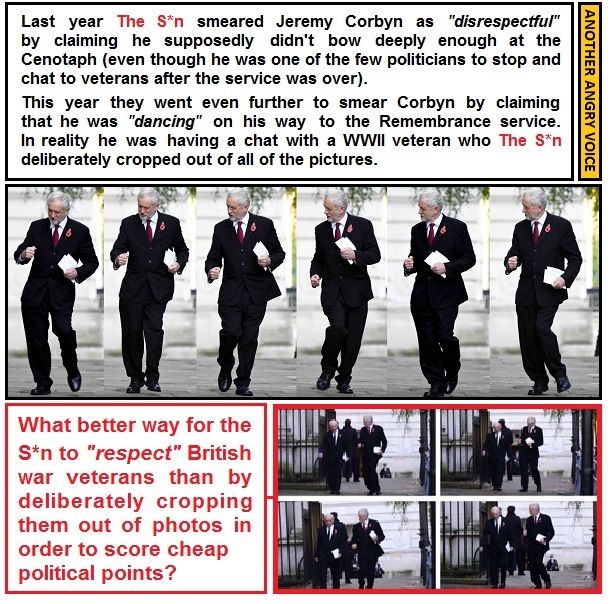 Then the next year they tried the same kind of trick, but this time by crudely photoshopping out the veteran Jeremy Corbyn was having an animated conversation with to make it look like he was dancing. 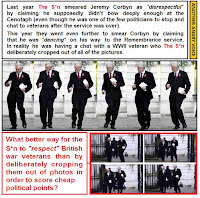 Then we all saw the original pictures and clocked that it was a ridiculously hypocritical smear that involved crudely photoshopping a WWII veteran out of a series of photos in order to accuse Corbyn of disrespecting veterans! One of the classic early Corbyn smears was the unsubstantiated assertion that Corbyn was somehow inerently "unelectable". 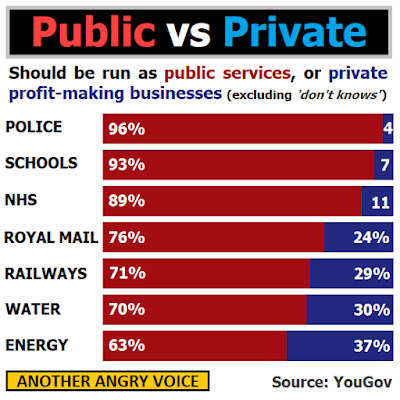 This particular smear was especially commonplace amongst Labour right-wingers who wanted Labour to continue offering the same watered down Tory gruel of privatisation, austerity, corporate outsourcing that lost them the 2015 General Election. It didn't seem to matter to these people that Corbyn twice proved that he was far more electable than them by trouncing their neoliberalism-lite candidates in the Labour leadership contests of 2015 and 2016. 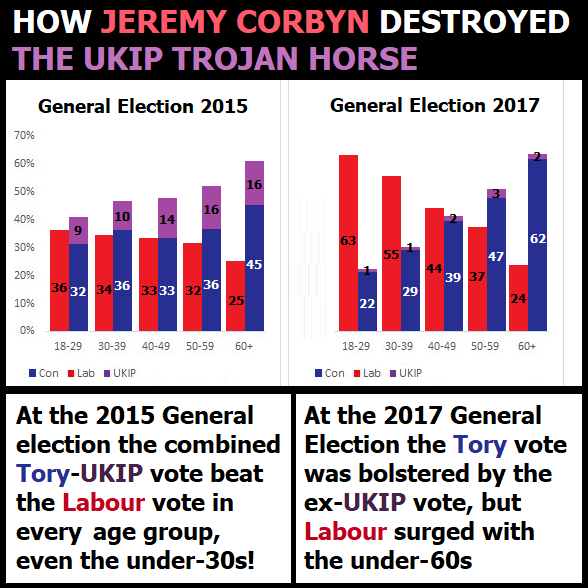 Then in 2017 the Corbyn did two things that were considered politically impossible (bringing out the youth vote, and engaging non-voters) to ruin Theresa May's vanity election and counteract the combined force of the Tory-UKIP vote. Suddenly the "unelectable" smear disappeared, because the neoliberal cultists suddenly realised their worst fear; that Corbyn is actually very electable, and that he only narrowly lost out in 2017 because of the internal wrecking behaviour of orthodox neoliberals embedded within the Labour Party. 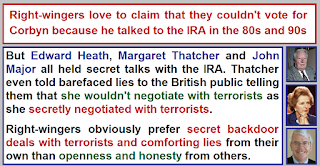 One of the most persistent anti-Corbyn attack points is the IRA smear & pictures of him meeting Gerry Adams. 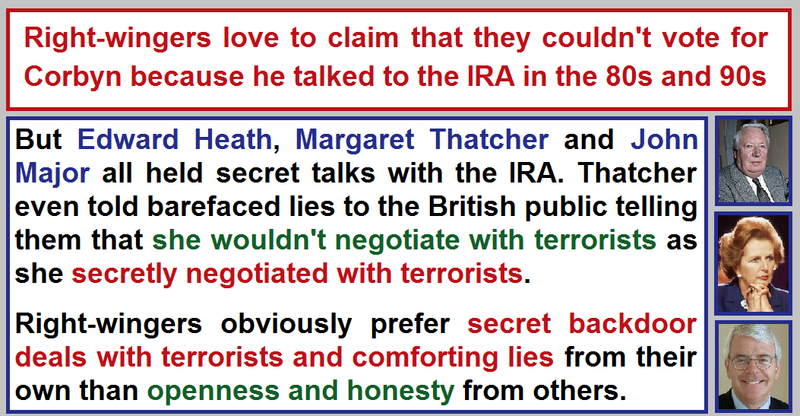 Pretty soon we all found out that they somehow "forgot" to mention that while Jeremy Corbyn was openly discussing peace with politicians from Sinn Fein (and Ulster loyalists too), Margaret Thatcher and the Tories were secretly negotiating with the actual IRA terrorists and simultaneously lying to the public that "we don't negotiate with terrorists"! One of the most absurd of all of the anti-Corbyn smears is that he's some kind of terrifying economic extremist. The slightest familiarity with Corbyn's economic policies reveals that his economic policies are actually a mix of centre-left ideas that are absolutely commonplace across the developed world (public ownership of core public services, free university education, a national investment fund, universal health care, normal rates of Corporation Tax ...). 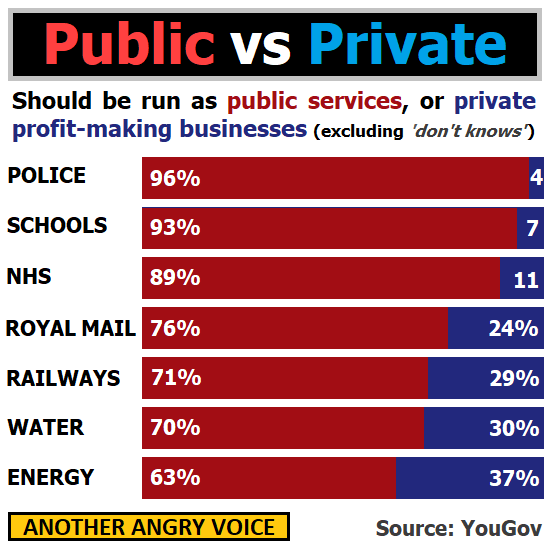 What's even more revealing is that Corbyn's public ownership policies are actually extremely popular with the general public, while it's the Tories pushing wildly unpopular extremist ideas like privatisation of policing, state schools, and the NHS! As with so many of the other anti-Corbyn smears, the economic extremist smear relies on a ridiculously Orwellian reversal of reality. Then it was the Islamist terrorism sympathiser rubbish, which made no sense at all even from the beginning given that Theresa May has been desperately sucking up to the head-chopping terrorism-exporting Saudi tyrants to sell them more weapons to commit their war crimes in Yemen with. The terrorist sympathiser smears began to make even less sense after Corbyn's tried to stop Britain exporting arms to the Islamist Saudi tyrants until they stop their war crimes in Yemen, and stop funding, and arming, and supplying, and promoting Islamist terrorist groups across North Africa and the Middle East. But then the Tories use of BNP-style terrorism and anti-Muslim fearmongering tactics to attack their political opponents isn't limited to Jeremy Corbyn, they used the same ugly and divisive anti-Muslim smear tactics to attack the unmistakably 'centrist' Labour politician Sadiq Khan too. Then it was the outright defamatory "Czech spy" smear, which worked for a while until it was discovered that the source of the allegations was a total bampot who also claimed to be the inventor of Live Aid! Then it was revealed that there isn't even a Czech secret service file on Jeremy Corbyn in their archives. 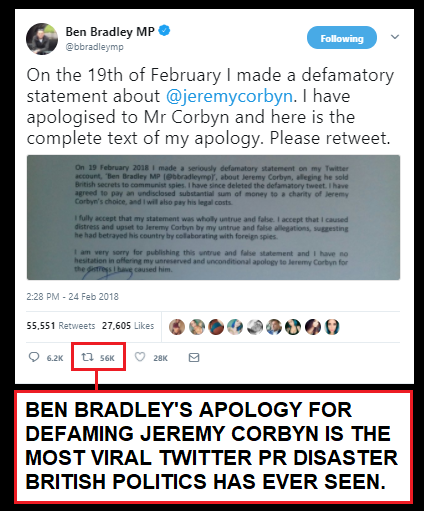 This ludicrous "Czech spy" smear was spread so enthusiastically by Corbyn-detractors that the Tory MP Ben Bradley was forced into issuing a Twitter apology, which rapidly developed into the most mega-viral social media PR disaster in the history of British politics! 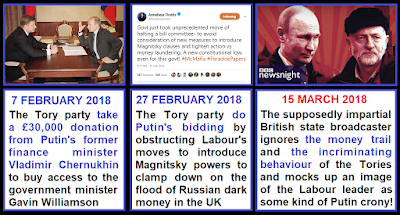 Then it was the 'Russian stooge' idiocy, which again made no sense at all, even from the beginning, given that it was the Tories who took £800,000 in donations from Russian oligarchs and Putin stooges since Theresa May became PM. 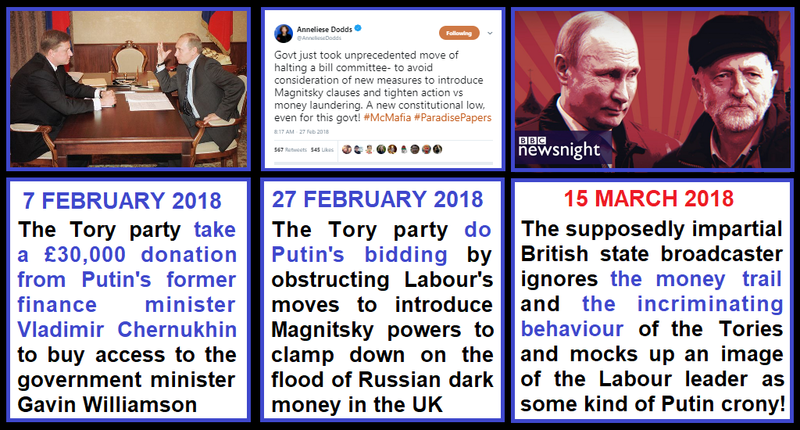 Then it was revealed that it was the Tories who intervened to stop him when Corbyn tried to introduce Magnitsky powers to clamp down on Russian dark money flowing into the UK! And now it's the cynical weaponisation of anti-Semitism to smear Corbyn as being as bad as Enoch Powell which relies on the deliberately misleading (and downright anti-Semitic) conflation of a critical comment about a bunch of rude and abusive Zionist extremists with an attack on all Jews. But it fell to pieces again when it was found that the anti-Corbyn pro-Israel MP Wes Streeting called the very same Zionist extremists "a bunch of yobs" when they wrecked one of his meetings. And then we found out that the actual guy who made the hyperbolic Enoch Powell comparison had publicly promoted a book by an extreme-right author that praised Enoch Powell and engaged in chapter after chapter of xenophobic and anti-Muslim fear-mongering! And then there's the fact that rates of anti-Semitism in the Labour ranks have plummeted since Jeremy Corbyn became party leader, and that anti-Semitic views are actually way more common in the Tory party (not that you'd ever hear about that in the mainstream media). 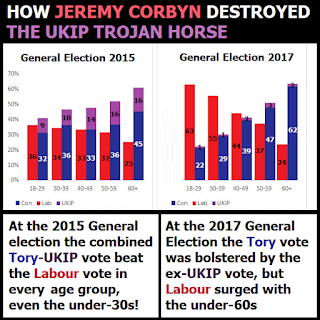 But despite the failure of each of their smear campaigns, on and on they'll go, trying to brainwash the public rejecting democratic socialism by smearing Jeremy Corbyn, believing with all their black little hearts that each new smear will be the magical one that returns orthodox neoliberalism to unquestioned supremacy in UK politics. And the reason they persist with these tactics is obvious. They know there's widespread public support for Jeremy Corbyn's centre-left public ownership policies. They know that ever more people are clocking the fact that Tory austerity dogma was never really about reducing the deficit because it's actually just a simple con-job to ensure the upwards redistribution of wealth. They know that Corbyn's proposal for a National Education Service to provide free education and training from cradle to grave is a great idea to help Britain become a modern fast-moving economy with a flexible and highly-trained workforce. They know that practically nobody apart from the corporate and mega-rich tax-dodgers could oppose Corbyn's fair tax policies. 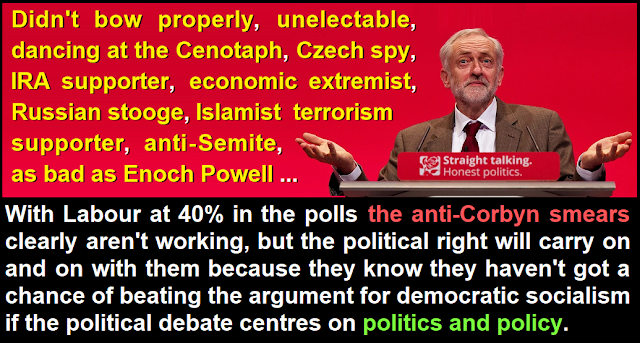 So they continually resort to their cultish efforts to brainwash the public into hating Corbyn, because they know they haven't a hope of beating if the debate is centred on political policy, facts, and evidence rather than propaganda, rhetoric and crude personality politics. If you ever needed an example of how 'centrists' and the hard-right work together in order to attack and undermine democratic socialism, look no further than the way coverage of the former Chief Rabbi Jonathan Sacks' scandalous comparison of the lifelong anti-racism campaigner Jeremy Corbyn with the anti-immigrant fearmongerer Enoch Powell spread from the supposedly left-leaning New Statesman to the front pages of the hard-right propaganda rags. Anyone who already knows who Jonathan Sacks should be familiar with his history of attending controversial Zionist extremist marches organised by the pro-settler Mizrachi Olami organisation, where chants of "death to Arabs" and vandalism of Palestinian property are commonplace. The same Mizrachi Olami organisation supports illegal Israeli settlements in the occupied territories and organises marches through the occupied Palestinian settlement of Hebron, which is basically a much more extreme version of the sectarian Orange Order mob organising inflammatory marches through Catholic areas of Northern Ireland. 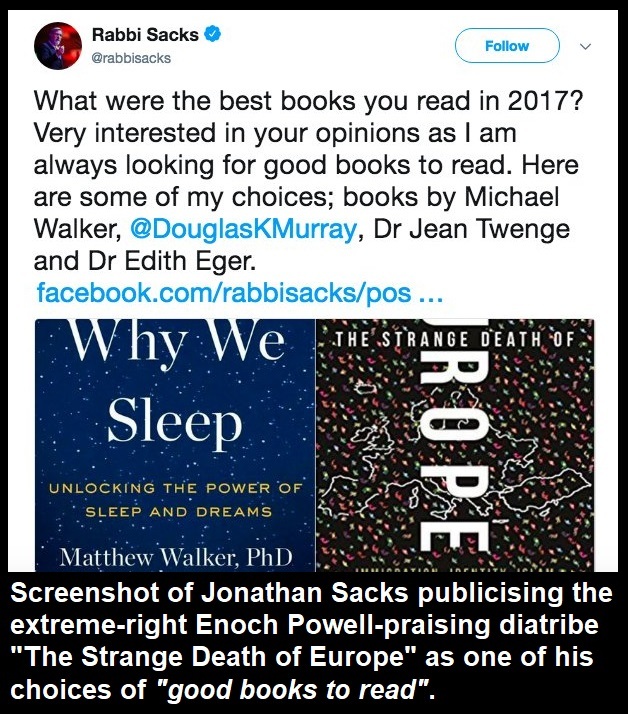 It's also worth pointing out that Sacks comparison between Jeremy Corbyn and Enoch Powell is more than a bit hypocritical given that he publicly recommended the anti-immigrant anti-Muslim Douglas Murray book "The Strange Death of Europe" as one of his best books of 2017, which contains glowing references to Enoch Powell, and chapter after chapter of xenophobic and anti-Muslim fear-mongering. Is someone who attends extreme Zionist marches and promotes xenophobic Enoch Powell-praising books really in a position to smear a lifelong anti-racist campaigner with comparisons to Enoch Powell? The origin of the hyperbolic comparison between Jeremy Corbyn and Enoch Powell was made in a New Statesman interview conducted by George Eaton, when Jonathan Sacks described Corbyn's "no sense of irony" comments about a specific group of rude and disruptive Zionist extremists with Enoch Powell's 1968 anti-immigrant "rivers of blood" speech. Unsurprisingly the New Statesman ran with the smear as the headline for their article for its clickbait potential, but at no point did Eaton try to hold Sacks to account by questioning his justification for making such an extreme statement. It's beyond doubt that Eaton know that the Corbyn "irony" comment was aimed at a small group of extreme Zionists who regularly disrupt meetings on the Israel-Palestine issue. When Corbyn criticised them for having no sense of irony, they had been rudely berating and insulting the Palestinian ambassador. On a previous occasion they turned up to an anti-genocide meeting to repeatedly shout "boring" at every non-Jewish genocide survivor who spoke at the event. On another occasion the Zionist extremists turned up to disrupt a meeting that the anti-Corbyn pro-Israel Labour MP Wes Streeting was involved with, resulting in him calling them "rude yobs". Interestingly nobody from the mainstream press attempted to misleadingly turn Streeting's criticism of the very same people as "rude yobs" into a criticism of all Zionists, or even all Jews as "rude yobs". If these extreme Zionists are so exasperating that even an extremely pro-Israeli MP like Wes Streeting ends up calling them "rude yobs", perhaps criticising their sense of irony isn't quite as bad as "rivers of blood". It's also worth noting that deliberately conflating Zionists with Jews is considered by many to be anti-Semitism because Zionism is a political choice, and not all Jews are Zionists (especially not the kind of extreme Zionists who habitually interrupt Israel-Palestine meetings to shout abuse at people that Corbyn and Streeting were criticising). In their desperation to attack Corbyn by conflating a specific group of Zionist extremists with all Jews quite a few of Corbyn's fiercest critics have actually exposed themselves as being prone to anti-Semitic speech. Anyhow, George Eaton didn't bother to point out any of this important context in the article. Despite failing to call Jonathan Sacks out on his hyperbolic smear, Eaton did attempt to challenge Sacks on the Israeli government's recent introduction of the Apartheid-style Nation State law. Sacks' response was absolutely dismal. Instead of criticising the racist Jewish-supremacism of the hard-right Israeli government, he made an evasive comment claiming ignorance of the significance of the law, followed by a second had assertion via his brother claiming that there was nothing Apartheid about the Nation State law, and that it was just "correcting a lacuna". So according to Sacks, a hotly disputed and vehemently debated Jewish supremacist law that strips Arabic of its official language status in Israel is just filling a space, not because he's thought about the issue himself, but because his brother told him so - but in the very same interview he's publicly accusing someone else of being "low, dishonest and dangerous"! After the New Statesman article was published, the context-free "Enoch Powell" comparison was churnalised onto the front pages of the hard-right Daily Mail and Daily Telegraph. 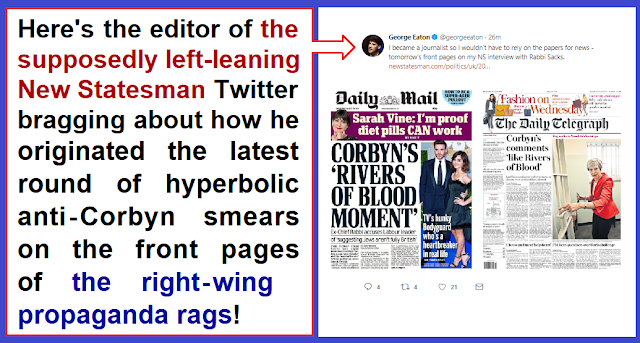 You would have thought that the editor of a left-leaning political magazine would have been horrified that his article had been used as the basis of yet another right-wing effort to damage the appeal of democratic socialism by smearing Jeremy Corbyn, but you'd be wrong. 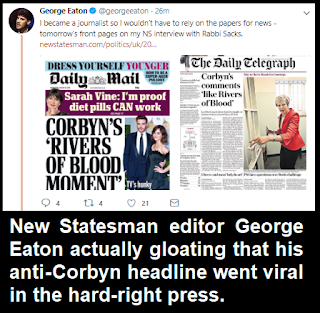 Eaton was so giddy with delight that his article was the basis of two front page Corbyn smears in the right-wing propaganda rags that he sent out a gloating Tweet about it. Presumably he eventually thought better of this outrageous gloating because the Tweet is now gone, but not before I grabbed a screen shot of it (see image). 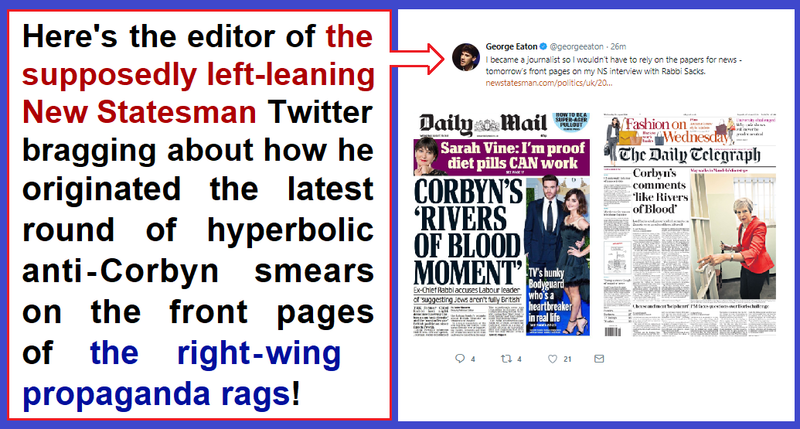 Way-hay, my anti-Corbyn smear story has gone viral in the hard-right press is certainly not a great look for the editor of a supposedly left-leaning publication, but it is indicative of the way that the supposedly left-leaning 'centrist' types are often more than happy to work with the hard-right to undermine democratic socialism. Left-leaning publications like the New Statesman, Guardian, Mirror, and Independent are significantly better than the right-wing propaganda rags because they occasionally give voice to democratic socialists, and often hold the Tory government to account on issues where most of the mainstream media turn a blind eye. However, they're also home to plenty of people who are more than happy to amplify the right-wing anti-Corbyn smear campaigns by lazily churnalising smears from the right-wing propaganda rags into their own articles, and even feeding new smears back to the right-wing press and then gloating about it like Eaton did. Perhaps it's unsurprising that a guy who actually recommends a far-right book that promotes xenophobia, anti-Muslim sentiments, clash of civilisations type fearmongering, and the lionisation of Enoch Powell, doesn't see the likes of Farage and Leave.EU as problematic? It's impossible not to note the hypocrisy of a man who one day publicises an anti-Muslim diatribe of a book that glorifies Enoch Powell, then the next uses a comparison with Enoch Powell to attack someone simply because they've got a history of arguing against the Israeli occupation and the brutal repression of the Palestinian people. It's hardly surprising that a man who supports pro-occupation pro-settler movement in Israel would use his position to attack a vocal critic of the occupation, but what is truly shocking is that the journalist who interviewed him didn't just fail to call him out on this hyperbolic smear over some deliberately out-of-context remarks, but actually gloated when his uncritical interview was used as the basis for another round of anti-Corbyn front page smears in the right-wing propaganda rags. Theresa May's dance moves are not great. She was filmed dancing at a school in South Africa and people are taking the piss. Sure, she's a public figure and ridicule should be expected in a country where people have the free speech to criticise their political leaders, but surely there are more important things to criticise her about? 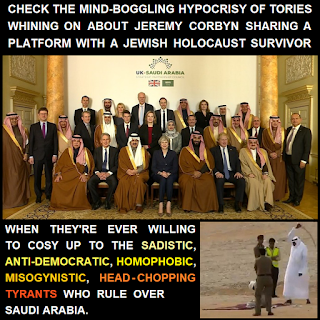 Theresa May knows that the tyrannical rulers of Saudi Arabia are using British weapons to commit war crimes in Yemen, yet she continues signing £billions worth of arms export licences to the homophobic, misogynistic, democracy-crushing, terrorism-spreading, head-chopping child-killers. When she was Home Secretary Theresa May personally implemented an outrageous and racist policy of "deport now, hear appeals later" against British citizens. This policy also involved systematically denying jobs, accommodation, social security, and health care to huge numbers of (mainly elderly) British people without the documentation to prove their British citizenship. Violent crime is soaring all across the UK thanks to Theresa May's policy of slashing police funding and scrapping 21,000 police jobs. At the time she was doing this she was warned by the experts that over-stretched and under-funded police forces would lead to more violent crime, but she actually dismissed these concerns as "scare-mongering" and "crying wolf" and ploughed on with her ideologically driven cuts agenda regardless. Another one of Theresa May's crackpot schemes as Home Secretary involved introducing ridiculously botched legislation to deal with so-called "legal highs". May just copied the legislation off Ireland in spite of the fact that the Irish policy of pushing the novel psychoactive substances market into the hands of criminals led to the biggest increase in consumption of these substances anywhere in Europe! Yet another of Theresa May's horrific policies at the Home Office involved setting an arbitrary and discriminatory income requirement for British spouses bringing their non-EU partners into the UK. She didn't care that people coming to the UK because they have a spouse here are by far the most likely to integrate, learn the language, find good jobs, and contribute to society Neither did she care that plucking an arbitrary figure out of the air heavily discriminates against women and people who live in poorer regions of the UK. 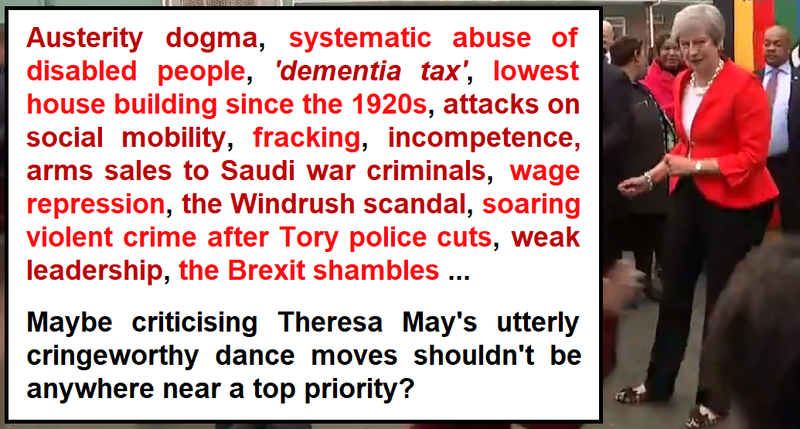 Theresa May has continued to push hard-right Tory austerity dogma in order to make the poor and ordinary pay the entire cost of the bankers' crisis, while corporations and the mega-rich actually get showered with handouts and tax cuts! 86% of the burden of this ruinous Tory policy has been loaded onto the shoulders of women. Theresa May is one of the few Tory politicians to have remained in government for the entire eight year period since 2010. In that time British workers have suffered from the longest sustained collapse in the value of their wages on record, and the Tory government has overseen the lowest levels of house building since the 1920s. During Theresa May's time in government the Tories have introduced a massive tax cut for fracking companies, then repeatedly over-ruled local communities who don't want this environmentally damaging and highly inefficient form of energy extraction in their local area. When Theresa May became Prime Minister she cried crocodile tears about social mobility, but then with virtually her first act as Prime Minister she scrapped the maintenance grants that help youngsters from poor backgrounds to get a university education. Theresa May openly bragged to parliament about her willingness to incinerate 100,000 innocent men, women, and children using nuclear weapons, then allowed her defence secretary Michael Fallon to rewrite Britain's nuclear policy on the spot by declaring that under Theresa May's leadership Britain could use nuclear bombs as attack weapons (amazingly Jeremy Corbyn was attacked and derided by the mainstream media and the wall of gammon for sticking with the more sensible "no first strike" policy). In November 2017 the Daily Mail produced an outrageous Nazi-style front page headline attacking three high court judges as "Enemies of the People" because they ruled that parliament is legally sovereign when it comes to passing laws, not the Prime Minister. Theresa May and the Tories refused to criticise this overt attack on the independence of the judiciary, and a few months later May actually hired the author of this disgusting piece (James Slack) as her press secretary! In 2016 Theresa May signed off on an extraordinary rip-off deal to bribe China and France into building a nuclear reactor for the UK with a promise to pay them double the market price for electricity for 35 years (the reason Britain can't build its own power plant is that the Tories privatised our nuclear expertise in 1996 into the hands of private profiteers who eventually flogged it all off to the French government). Since becoming Prime Minister in 2016 Theresa May has continued to oversee the systematic abuse of disabled people via dehumanising and discriminatory assessment regimes that cost way more to administer than they will ever save in reduced disability benefits claims. Theresa May continually refuses to condemn Israeli brutality against the Palestinians, even when it comes to using snipers to kill non-violent protesters, journalists, medics, and children. She refuses to condemn the hard-right Israeli government for introducing a new Apartheid "nation state" law. She also continues selling arms export licences to Israel as they carry out these outrageous attacks and implement overtly racist government policies. During the 2017 General Election Theresa May oversaw the publication of a shambolic manifesto with no costings whatever, then set about tearing pages out of it within days because of the public backlash against her "Dementia Tax" policy of asset stripping frail elderly people who end up needing social care services, then had a massive "nothing has changed" public breakdown under the stress. Theresa May has demonstrated time and again that she's a hopelessly weak leader without the authority to sack her ministers, even for the most blatant abuses of their office. When Priti Patel was caught working as an operative of a foreign state embedded within the UK government, she was allowed to resign and keep her job as a Tory MP. When Boris Johnson made one idiotic remark after another and even broke collective responsibility by publishing his own personal Brexit manifesto - he wasn't sacked. This hopelessly weak leadership means the liar Esther McVey and the serially incompetent Chris Grayling still sit in her cabinet! Theresa May has repeatedly fantasised about scrapping British people's human rights by withdrawing from the European Convention on Human Rights (ECHR). It's no coincidence that multiple Tory policies from their imposition of financial barriers to the justice system, through their forced labour schemes, to their savage mistreatment of disabled people, are all incompatible with the ECHR. And then there's Brexit. If anyone thinks she's doing a good job of managing the Brexit process you must be either delusional, or one of the mega-rich speculators banking on getting rich by betting against Britain as she deliberately drives the British economy over a cliff. Basically, in light of all of this, if you're taking the piss out of Theresa May's lame dance moves, you're actually giving her an easy ride, because ridiculing her cringeworthy dancing is basically the equivalent of Rupert Murdoch's bacon sandwich attack on Ed Miliband. 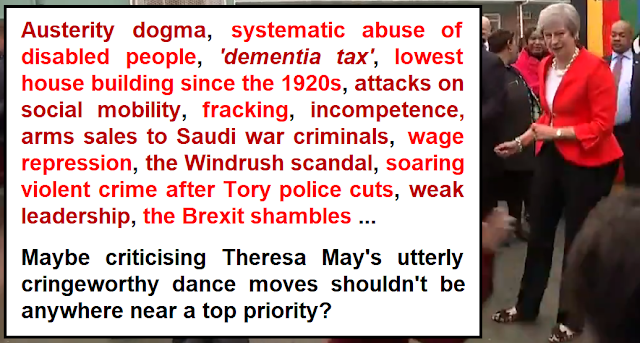 By focusing attention on some trivial issue like her crappy dance moves, people are actually distracting attention away from her malice, her incompetence, and all the vile policies she's promoted, and even laying the foundations for right-wingers to paint this absolute monster as the poor innocent victim of cruel attacks from "nasty lefties"! Where is the media outrage?